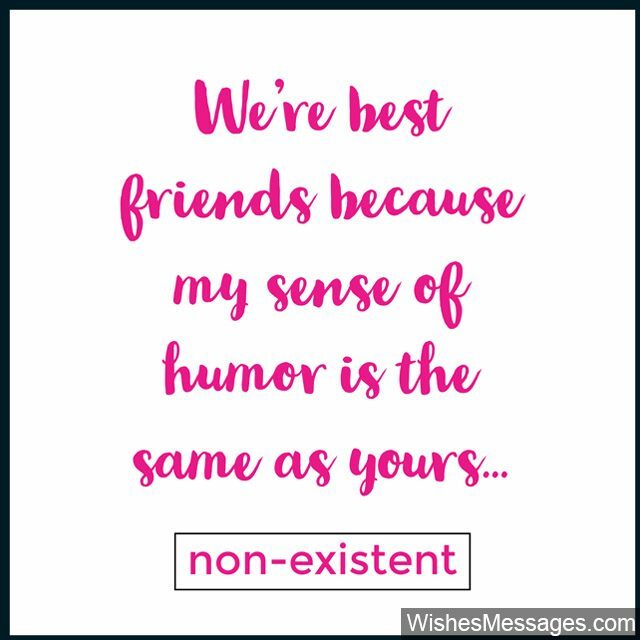 Funny Messages for Friends: Bored of the cliché friendship quotes? Well so are we and nothing better than some craziness to stir things up. From farts to turds and from banter to hits below the belt – BFFs, besties, best friends and bae are on the chopping block here. And don’t just wait for Friendship Day to tell your friends how much they mean to you. 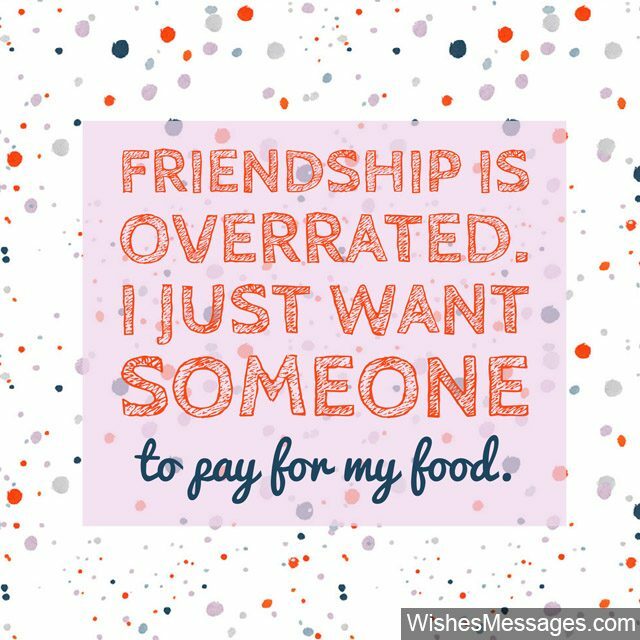 Read these cute quotes and try to relate them to your own friendship. Use that as a base and think of something original that you can send as a message or even put it up on your Instagram story… all is fair in love, war and friendship of course! Go on, put a smile on the faces of your besties. After all, best friends do stupid things together don’t they! 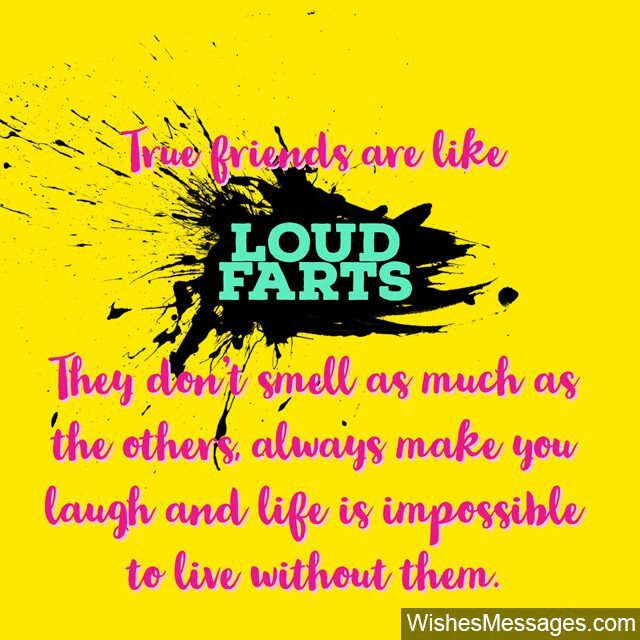 1) True friends are like loud farts. They don’t smell as much, always make you laugh and life is impossible to live without them. 2) Sometimes I feel that I can have better friends. But then so can you. So let it be… besties for life shall we say? 3) The only reason we’re friends is that you know way too many of my secrets. 4) I feel horrible about myself for not having accomplished anything in life… but then feel better when I see where you are. Thanks for being my best friend. 5) Friendship is like turd. No matter where you are or what you’re doing, a bit of it is always there inside you. 6) We’re best friends because my sense of humor is the same as your… non-existent. 7) You’re annoying. You’re weird. You’re crazy. You’re stupid. You’re clingy. You’re… just like me. 8) If we’re on a plane that was about to crash and there was just one parachute… I promise to give the best speech at your funeral. 9) Damn you must really be a loser to find a friend in another loser like me. 10) I’ll swim through an ocean to save you. Ok, not an ocean but a pool definitely. But not too deep though because you know… I don’t want to wet my hair. 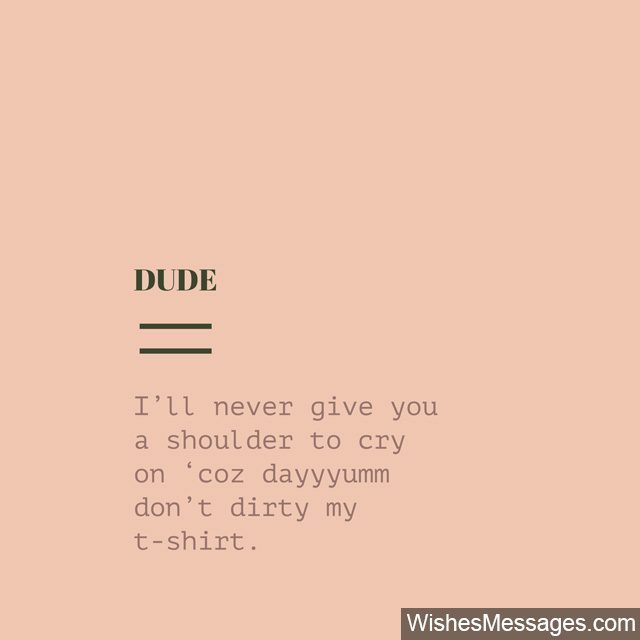 11) I’ll never give you a shoulder to cry on ‘coz damn don’t dirty my t-shirt. 12) Don’t worry my friend, if you ever fall down… I’ll always be there to take a selfie and post it on Instagram. 13) I knew it was friendship as first sight when I saw that we are the same kinda crazy. 14) Good friends are those who not share common interests, but are the same levels of stupid. 15) I know, it is so hard to friend who’s loyal, caring, honest and cute. Lucky for you, I’m all of those and more! 16) Friendship is overrated. I just want someone to pay for my food. 17) Good friends will come and go, but best ones end up harassing you for a lifetime. 18) Stupid fights, stupid nights, stupid memories – no wonder I’m best friends with you… ‘coz you’re my kinda stupid. Thanks for being my BFF. 19) You can work out all you want but you’ll never be as hot as me! See ya at the gym. 20) When you laugh so hard with someone that you inadvertently let out a fart… that’s the person who’s your best friend. 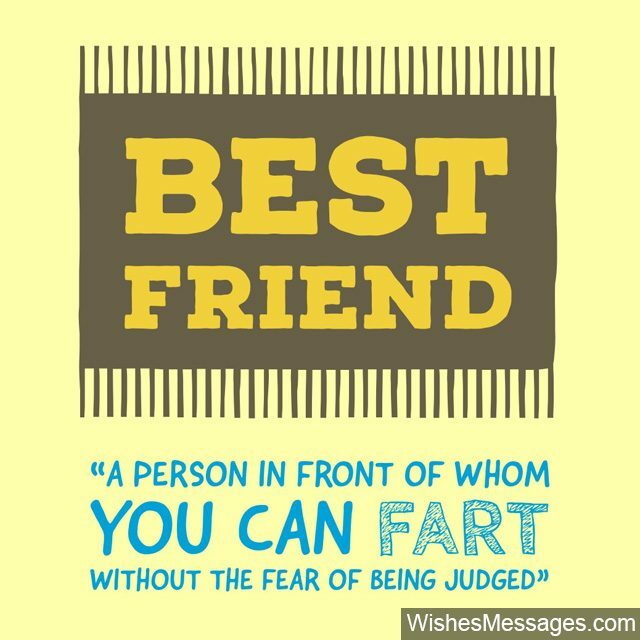 21) Best Friend: A person in front of whom you can fart without the fear of being judged. 22) The only reason why you’re my friend is because you never borrow money from me… and lets keep it that way. 23) Thank god you have me. Who else would understand you? 24) No one understands my joke except you. That make you kinda weird… just like ME. 25) Our friendship is based on a mutual understanding – if you reveal my secrets you’re dead to me. 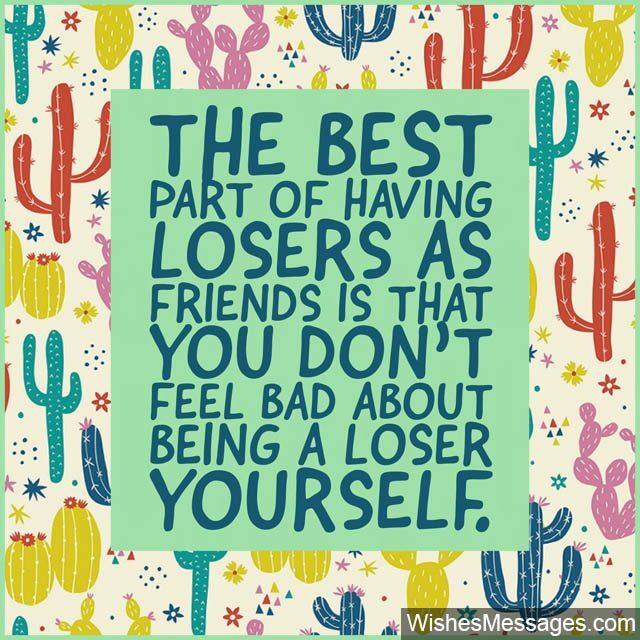 26) The best part of having losers as friends is that you don’t feel bad about being a loser yourself. 27) You are my friend only because your stupidity is like therapy to me. 28) You’ll always be my best friend because you’re the only one who’s heard me fart. 29) I often think why I’m best friends with you especially when you have a pathetic sense of humor and you’re such a big bore… but then I remind myself that you know so many of my secrets. 30) Nothing can change our friendship… except better friends of course.